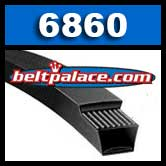 GATES 6860 POWERATED BELT. 1/2" W x 60" L. Premium Gates Brand Aramid/Kevlar Lawn and Garden belt. Gates Product ID: 84236860.